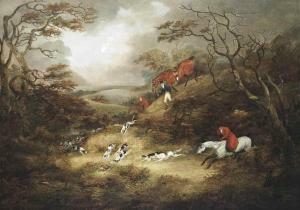 Find artworks, auction results, sale prices and pictures of Dean I Wolstenholme at auctions worldwide. 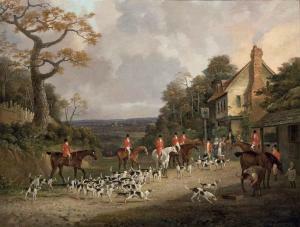 Dean Wolstenholme the Elder (British, 1757-1837), Hunting Scene, oil on canvas, signed lower center right, artist's placard affixed lower center, canvas: 36"w x 50.75"w, overall (with frame): 42"h x 56.5"w; Provenance: Collection of William and Irene Grimm; Collection of Laisder Roberto De Mendoza; Collection of Father Barea; Itton Court Collection. J. Oakley Maund Esq., Briggens Park, Hertfordshire. Mrs Oakley Maund; Christie's, London, 18 July 1903, lot 122 (30 guineas. to Pollard). 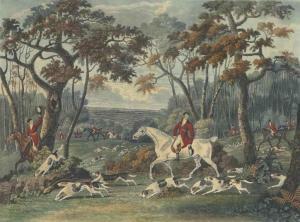 A set of 4 hand-coloured aquatint plates by D. Wolstenholme junior after Wolstenholme senior (margins trimmed with loss of imprint), 384 x 492mm, framed and glazed (unexamined out of frames). numbered and headed: 'Going Out'; 'Drawing Cover'; 'Full Cry'; and ''Returning'. Strong emphasis is put on the speed and strength of the undulating dog pack. Led by the tenacious dogs, horses and riders pass through a mix of open country and tree-studded land of remarkable natural beauty. Mellon/Snelgrove Wolstenholme 7; Siltzer p. 312. 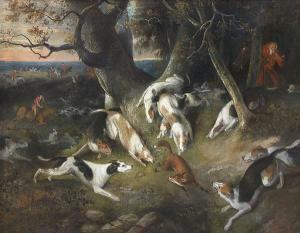 Anonymous sale; Sotheby's, New York, 9 June 1989, lot 30, where purchased by the present owner.